If you had asked me earlier this week what I planned to do at 7pm on Saturday evening, Judson’s last night in Manila, I would have told you, with galvanized excitement, that we would be making grilled cheese. While watching Chef on Tuesday night, Judson confessed that he is a fromage aficionado whose culinary expertise at nine years old rendered him something of a master at grilled cheese sandwiches. The simple notion of grilling some bread with cheese quickly mutated into something much larger and monumental. We were not making grilled cheese; we were making the best GRILLED CHEESE in the entire world, ever, and it was going to taste like unicorn milk and the sighs of newly christened angels. Of course, this did not happen, because Saturday at 7pm, we found ourselves cramped in the upper deck of a ferry bound for Cebu. Which might have been fine if Cebu had been anywhere at all in our itinerary. Which it wasn’t. At any point. Let me preface this by saying that, before moving to the Philippines, everyone told me that getting out of Manila was a cinch. This has yet to happen, unless they’re referring to the cement islands along the motorways, in which case yes, I have had a beer while passing one of those in a bus. Still, I was optimistic. Judson and I left our balmy, idyllic resort at 3pm for Tagbilaran City Airport. A light sprinkle of rain dusted the roadways but apart from that, the weather was calm. 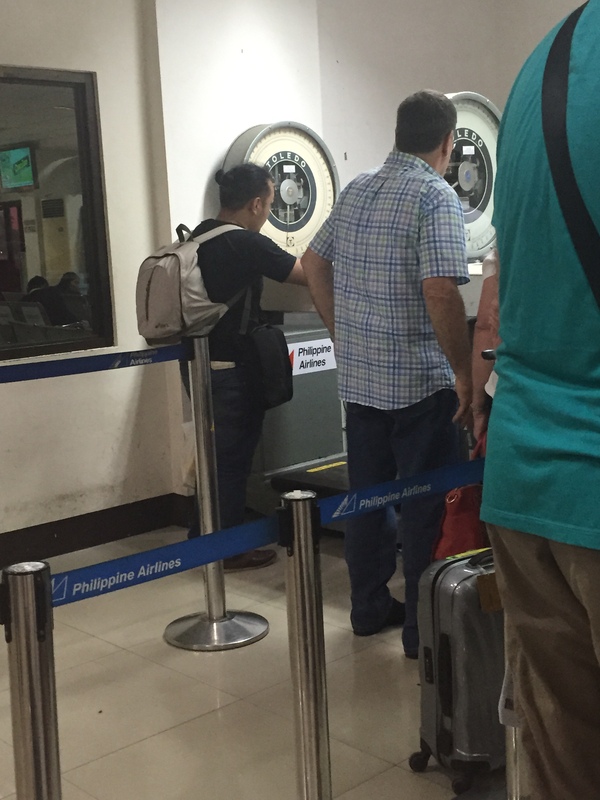 Tagbilaran Airport, redefining retro with its luggage scales. 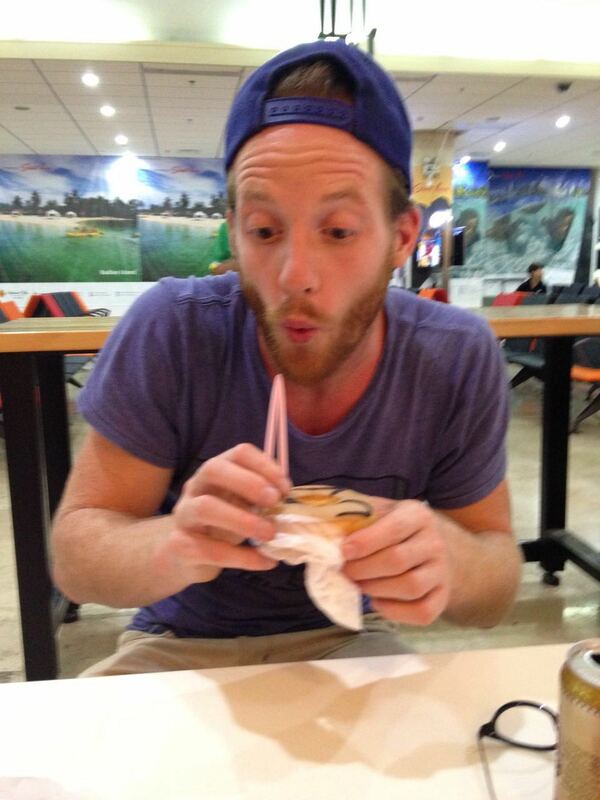 As far as we were concerned, we were making it back to Manila with plenty of time to make the Best Grilled Cheese Known to Man before Judson caught his 6:30am flight to China the next morning, which also happened to be his birthday. We were whisked through a modest security check and into the sole waiting area in the airport. This place was tiny, a glorified little garage hangar boasting a single runway, but it was cozy. Judson bought us ube pitas and we snacked on those and peanut kisses while reading. Outside, the sun shone brilliantly. The Philippine Airlines flight had just arrived from Manila and our luggage sat on a trolley ready to be loaded. 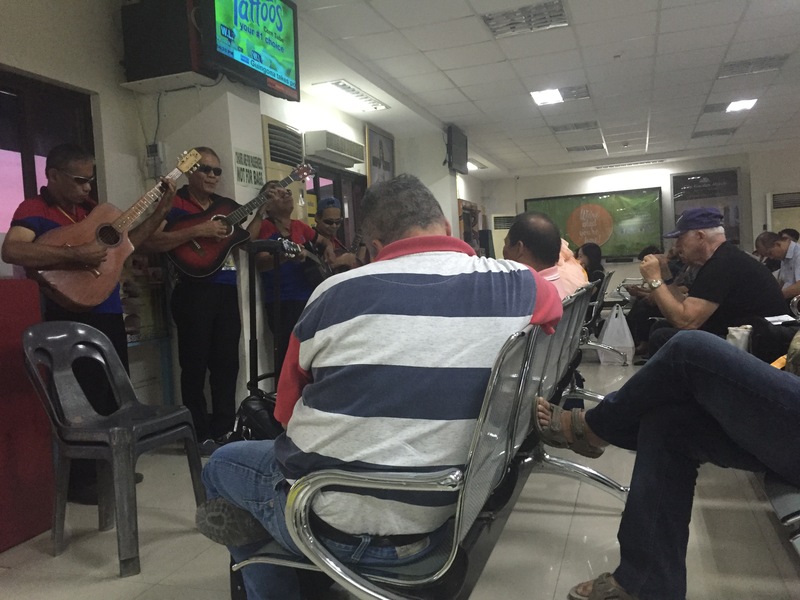 A quartet of blind men with guitars were led to the front of the waiting area to play music for us. We happily stuffed a tip into their donation box and awaited boarding in an optimistic stupor. 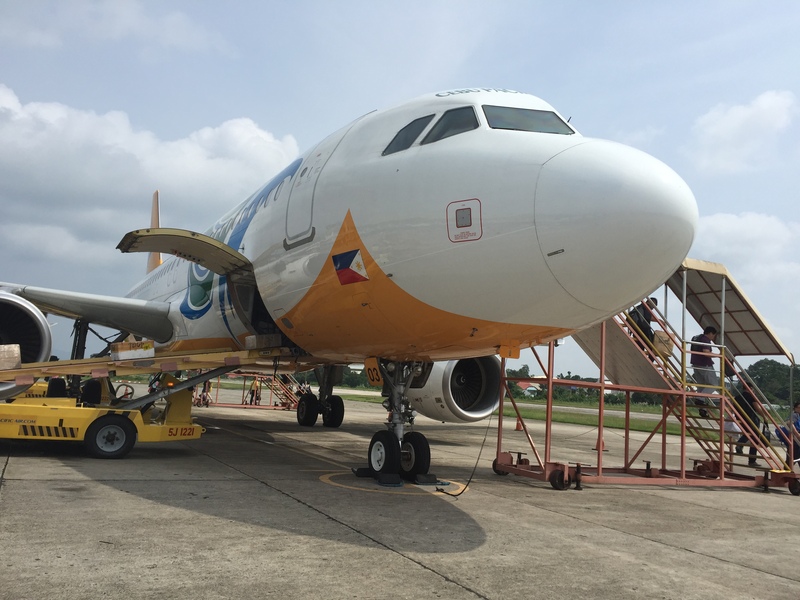 It’s important to note that this was the last flight out of Tagbilaran. With a giant plane occupying its single driveway-sized runway, there was no way another aircraft would be sent in to rescue us, so we joined the deluge of panicked passengers at the ticket desk. Worried about making his connecting flight, Judson went up to the second story office and I hung out in a queue that advanced glacially. At the time, it seemed a good idea to split up, but as my line advanced, I realized that Judson had made off with our flight tickets and I had no way to reach him. It was then, in the melee of rebooking, that I felt a gloom-slicing thrill. We were basically in the Amazing Race. This was how it felt to be one of those pairs who runs to the airport in the lonely predawn hours and has to choose whether to book the first direct flight or take a roundabout trip, and they book the direct flight only to find that it’s been delayed! This would have been more fun if Judson didn’t have a flight to catch at 6:30 in the morning and there was prize money involved. The Philippine Airlines desk attendants seemed keen on maintaining an air of mystery regarding what options we had. No announcements were made to inform us as to whether or not there were viable means of reaching Manila that night, and passengers who had finished rebooking scuttled off quietly without revealing anything, which I thought was a little selfish. I finally managed to stare a guy down in the opposite line and ask him what the deal was. I glanced at my phone. 5:30pm. I was two people away from the desk attendant, and I had no way of reaching Judson to confirm. I must have incurred his wrath, because when it was my turn to rebook, he attempted to push past me before sighing and giving me a gesture that basically said, “OK, fine, I will very selflessly sacrifice my space so you can go first.” Which made no sense, because he was behind me. In the end, I went up and got him. Upon seeing us, the desk attendant immediately handed me a copy of our new flight details out of Cebu, which I accepted with surprise. We dashed out of the airport where an employee flagged us down. We breathlessly nodded as he ran to the road to hail a tricycle driver. Hastily, we threw our bags in what looked like a feeding trough attached to the back. I felt certain my backpack was going to tumble out and into a ditch and we would never notice. The tricycle ride through Tagbilaran City amped up the Amazing Race feel of the afternoon, and as our driver urged the sputtering vehicle up a steep hill, I realized that this was my very first tricycle experience in the Philippines. 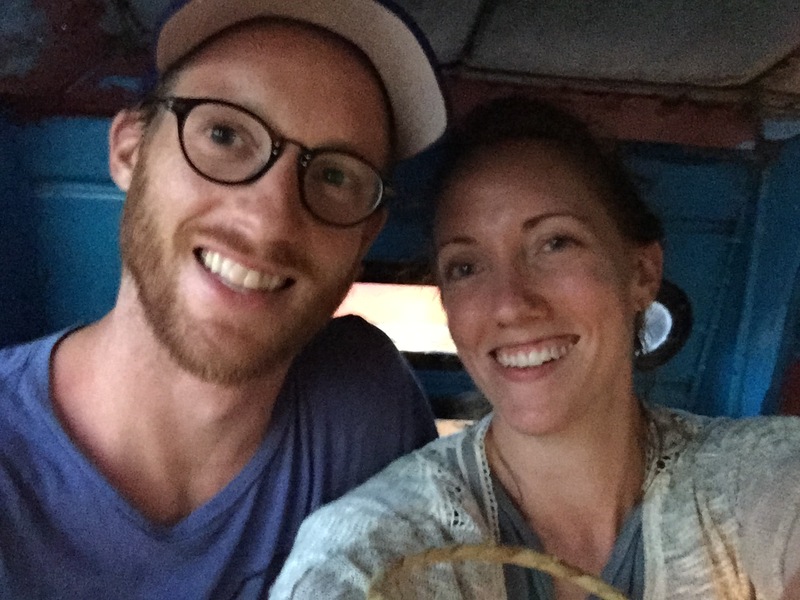 We whizzed past a massive bus and barely avoided a baby goat in the road. I suddenly felt positive again. We arrived at the seaport and fell into the first line we found. It was the wrong line. The man laughed at us and pointed us to the next line, which was longer. It was after 6 by now, but we made it up to the ticketing counter pretty quickly. “Do you want open air seats or air con?” Judson asked me. At this point, it’s important for you to know that, while I love the rocking motion of boat journeys, I had been advised to avoid ferries in the Philippines. “They overbook the ferries and they sink all the time,” Shar told me. Because she is both a librarian and my best friend, I did not question her, but instead solemnly vowed never to travel by ferry. “I could sit on the top deck,” I told her. I did not want to tell Judson this, so I simply stated that the top deck would be fine – at least there is some hope of surviving if we were not entombed in a lower deck. We rejoined the first line to get our assigned seats, then had to check Judson’s oversized hiking bag. 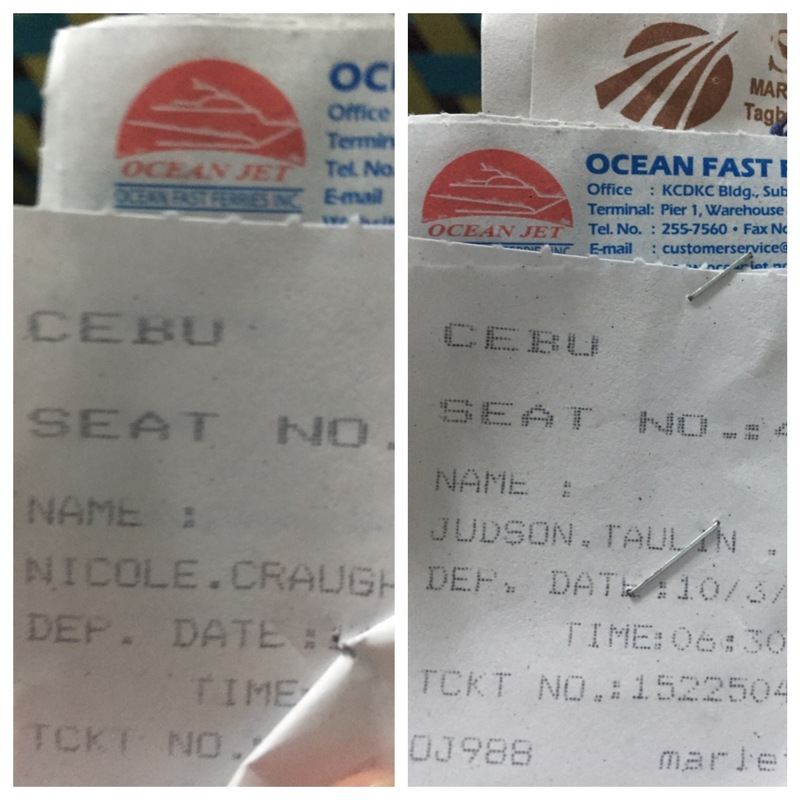 This was worrisome, as we had about 20 minutes to get from Cebu Seaport to the airport if we wanted to make our flight, and even that wasn’t realistic: the ferry departed Tagbilaran at 6:30pm, took 2 hours to arrive in Cebu, and our flight left at 9pm. The riskiness of our venture was reinforced again at a fourth window, where we had to pay a terminal fee before exiting. A man from our canceled flight greeted us at the same window, musing about how he had to catch connections in Manila and Tokyo before heading onward to LAX. “Your flight is at 9?” he asked, incredulous. The seaport waiting area was packed. Another quartet of blind musicians played for passengers, but livelier tunes involving a cajon and an upright bass. It would have been enjoyable under different circumstances. Instead, Judson and I stood against the wall quietly simmering in our own personal anxieties. At 6:35pm, an officer circulated through the waiting area and informed us all that the ferry was “delayed” and he had zero idea when it might arrive. It was time for some San Migs. En route to the counter, I ran into a couple sitting on the baggage carousel who asked me what the deal was with the ferry departure. “No one knows,” I told them existentially, and they nodded. “Have you never traveled here before?” asked the guy. 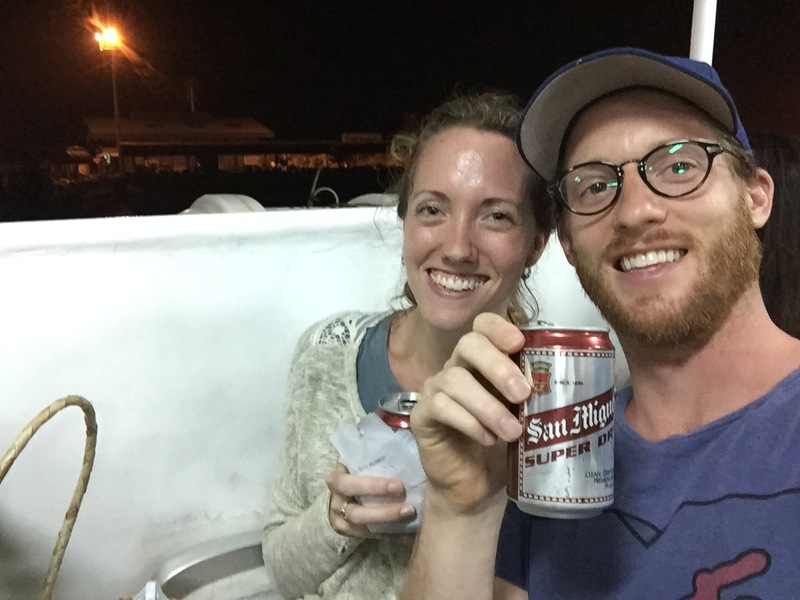 At 7pm, with two empty cans of San Miguel, we boarded the ferry. Immediately, we realized why Judson had to check his bag. We were practically sitting on top of each other with no leg room. My purse handles kept prodding the skull of the girl in front of me, whose friend was wearing a Survivor: Puerto Rico headscarf. I felt glad that I hadn’t bought more San Migs because getting out of the row to use the bathroom would have basically required me to crowd surf. The ferry idled at the port for a while. A drunk man in a Pittsburgh Steelers T-shirt shouted at the security officers about his seat, which possibly delayed the departure further. A safety announcement buzzed over the intercom, but no one could hear it. “I don’t have a life vest,” Judson remarked at one point. This scared me, but I felt like I could probably keep him afloat, as he is not 190lbs as I once believed. It wasn’t until 7:20 that we set sail for Cebu. There is something about being stuck on a boat for two hours that resigns you to the fact that you must relax, and breathe, and admit that everything is out of your control. The air felt clean and briny and cool, buoys glittered off to the side, and we both drifted off to sleep, woken only by the occasional shout from the drunken man who was staggering up and down the aisle for no real reason. We arrived in Cebu at 9pm. Despite the fact that our flight departed now, we were still feeling optimistic. “Maybe they held the flight for us,” Judson said. “It departed already,” I told him. It had not just departed already, it departed fifteen minutes early. Of all my experiences with flight cancellations and major delays, this is the flight that leaves early. “Where is your rate sheet? With your prices on it?” Judson asked the driver. Desperate, we paid the $11 fare and staggered to the Philippine Airlines ticket office outside the airport. It appeared closed, but Judson knocked and a man stealthily poked his head out. “Tagbilaran?” he whispered. We nodded and were hurried inside. The desk agents were pretty helpful. They informed us that there were no flights departing Cebu for Manila until the next morning, and that they would try to contact AirChina to reschedule Judson’s flight, much to his dismay. While they researched options, another agent came and collected our ferry tickets and refunded us 1000 pesos each. She led us through the airport to an office behind the check-in desks where employees were sleeping on the baggage belts. We were told to wait on the couch until the check-in desk opened. When it did, we slipped through with ease and found ourselves in a waiting area with a few restaurants. It was 11pm. We boarded at 12:15. It was the first time since 3pm that we could sit and relax. And in one hour, it would be Judson’s birthday. With great sorrow, we gave up the Grilled Cheese. 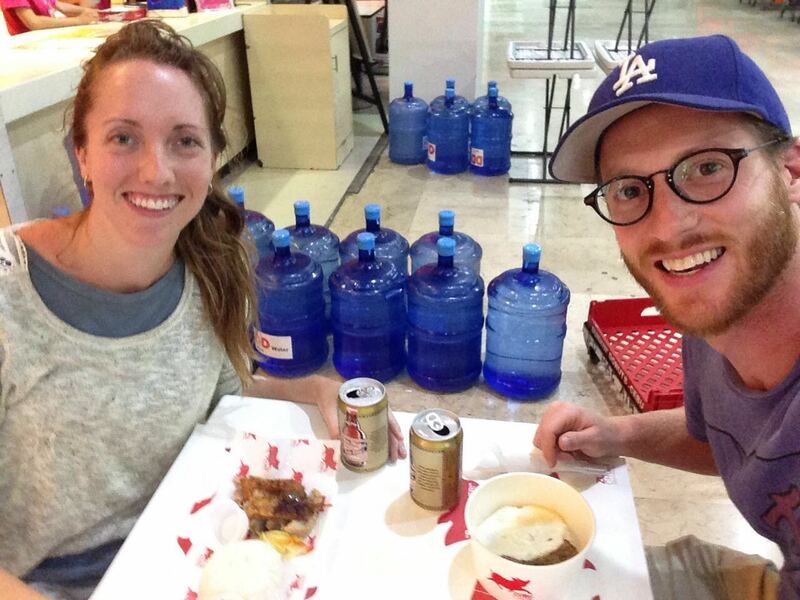 There was no hope; we’d arrive in Manila at 2am, have enough time for Judson to collect his things and repack, and then head back to the airport. 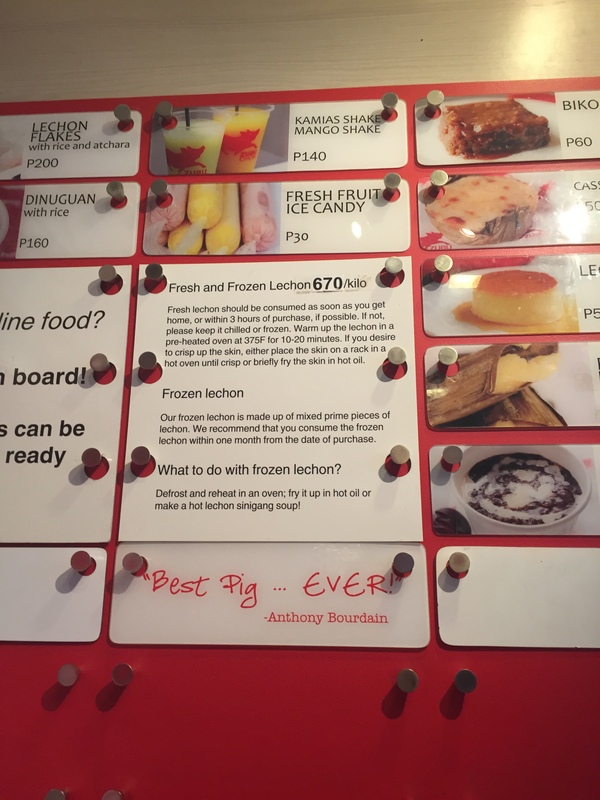 Instead, we settled on some Filipino food at a restaurant boasting Anthony Bourdain’s endorsement: “Best pig…ever!” Two San Migs, lechon, and some batang sisig later, we played a few rounds of HeadsUp that the restaurant employees felt keen to join in on. At five to midnight, I wandered over to Dunkin Donuts to buy a birthday Bunwich – for the sole reason that we had no idea what the hell a Bunwich was – and a doughnut. I was a little sad about the direction things had taken. This wasn’t the grilled cheese, movie night, birthday celebration with carrot cake cupcakes that we’d planned on, but I felt pretty proud that we’d kept our spirits up. 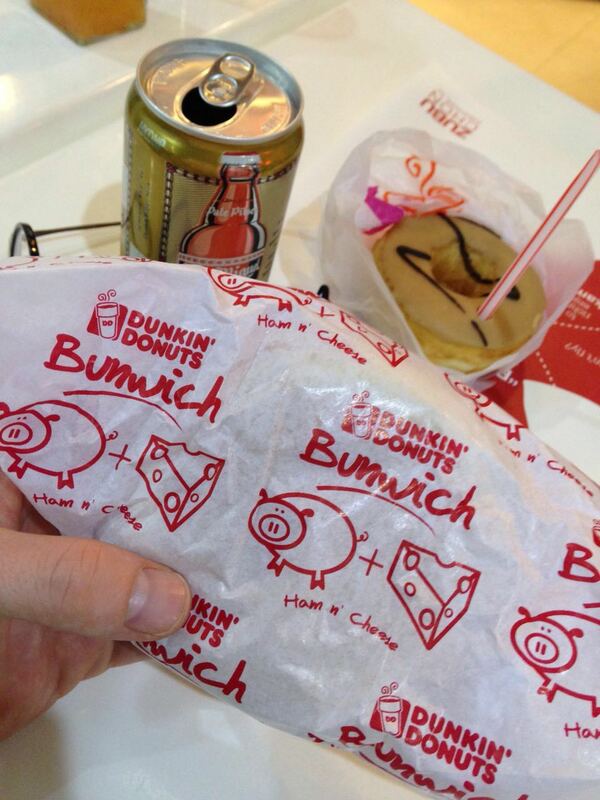 I ordered a ham and cheese Bunwich and a mocha doughnut and paid the cashier. It wasn’t that I hadn’t realized this before, but for some reason, I could appreciate it now. And as one of the three clocks in the room struck midnight, I realized that if our evening had gone according to plan, we would’ve been asleep by now instead of hanging out in Cebu Airport and listening to the Filipino restaurant employees singing the Scooby-Doo theme song. And Judson would have turned 33 unremarkably instead of over a greasy Bunwich and a mocha donut with a birthday straw stuck in it, which is clearly the best way to turn 33. Or, more likely, Judson and I should quit our jobs and go on the Amazing Race because we would definitely win. *This only applies if you are stranded somewhere with a stellar human being, and all of your plans eventually work out somehow.